Lodge Averon is situated in the town of Alness, Ross & Cromarty, on the shores of the Cromarty Firth. The Lodge received its Charter from the Grand Lodge of Scotland on 4th November 1897 and duly celebrated its Centenary in 1997. As part of the celebrations – under the then Master, Bro Ian Duxbury – a re-dedication ceremony was held within the Lodge. The Ceremony was conducted by the then MW Grand Master Mason, Brother the Rt Hon the Lord Burton. The afternoon meeting and evening harmony proved to be truly memorable occasions. The Lodge building itself is a monument to Freemasonry in the Alness area, both in bygone days and in the present era, and is considered by some to be the finest Lodge building in the Province of Ross and Cromarty. The following extract compiled by the late Brother James Whyte, long serving and loyal Secretary of the Lodge, explains the origins of the building. “The United Free Presbyterian Church stood at the corner of Union Street and Drummond Street, Inverness. It had been designed and built by the architect Alexander Ross in 1863/64. 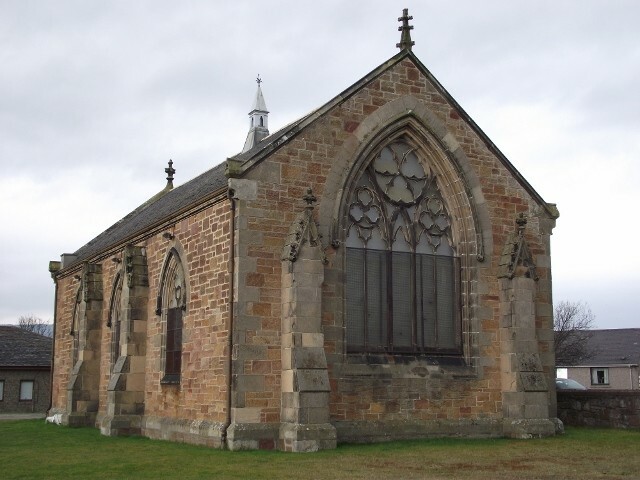 When the congregation of this Church moved to Ness Bank Church in 1901, the old Church was carefully demolished, the stones transported to Alness where they were rebuilt to form the building of Lodge Averon. The original site was taken over by the Royal Bank Scotland, with the Lodge building in Alness being completed by 1902/03. It is interesting to note that the architect for the Lodge was the same one who was responsible for the design of the original FP Church. He was a keen Freemason himself and served as RWM of St John’s Lodge No 6 and was credited with being the author of a book on the history of Freemasonry in Inverness. Records also show that the Church in Ardross, for the Perrins Estate of the time, was designed also by Alexander Ross and completed in 1899. This would indicate that there was no connection between the Church and the Lodge, the former having been completed three years earlier. A Short History of Alness. Alness has, over the centuries, been witness to change and development like no other community in Ross-shire, especially since her first recorded mention as ‘Alenes’ in1227. The town is actually a composite of two parishes; Alness and Rosskeen, divided by the River Averon. The original Alness was but a small crofting community opposite the old Kirk and saw it’s main expansion in the nineteenth century thanks to Captain Hugh Munro of Teaninich, who also founded Teaninich Distillery in 1817. Trading links with the south improved dramatically after the 1707 union and the evidence lies around the Cromarty Firth in the form of Girnels (store houses). One such stands at Alness Point. A short distance from the Girnel is the mansion of Teaninich House, built by Captain Hugh Munro in 1784. Munro was responsible for alterations to the course of the River Averon in 1844 and Teaninich remained a Munro seat until the First World War when Charles Harrison, the American on whom the book Little Lord Fauntleroy was said to be based, bought it. Another famous name with Alness connections is Charles Macintosh. Who? In the mid 1700s George Macintosh lived at Newmore. His son, the aforementioned Charles Macintosh, was born in 1768. He made his name in science and is credited with inventing a revolutionary bleaching powder. His partner Charles Tennant took out the patent in 1899, but it is believed that Macintosh was the real creator. Another invention was waterproof materiel. Macintosh was aiming this at the manufacture of tents, but was also used in clothing The MacKintosh or Mac. The material was first introduced in 1824. Towering over Alness is Cnoc Fyrish (1478ft) and at its summit is Fyrish Monument. This was the brainchild of Sir Hector Munro of Novar who had it built in 1792 to provide work for unemployed workers. The monument is an imitation of the gates of Negapataum in India. There are three other structures on and around Fyrish, but these are more follies than monuments. They were painted white and the original plan, apparently, was to have them all linked by a wall. In 1854, David Forsyth was born in Alness. Not a household name but avid chess players may have heard of his invention; the Forsyth Notation. This is one of a number of systems used for recording on paper the positions of chess pieces, such as can be seen in newspapers today. You can find out more about our town by visiting the Alness heritage website.